We love “Da Sauce” from Local Boyz, a small Hawaiian Restaurant tucked away in the back upstairs corner of the Cobblestone Square, a small shopping center that butts up to Oregon State University. The delicious teriyaki sauce and marinade comes in small bottles that are put out on the tables and frequently would go missing as the plethora of college students and others eating at the establishment would decide to take home a bottle of the tasty sauce. When I was a student at Oregon State University I would often make the trek to grab some of the marinated steak (marinated in “Da Sauce”) over white rice and macaroni salad on the side(copycat recipe here). It was a bit more spendy than my usual student fare but it was worth it. I would cover entire meal in “Da Sauce” and eat until I was stuffed, enjoying every bite. When I graduated and we moved away I found myself missing “Da Sauce”. My wife, who also went to Oregon State, missed it as well. Our desire to have “Da Sauce” wherever we are has resulted in this recipe. I use it as a teriyaki sauce and as a Marinade for chicken, beef, and pork. It is also a component in other recipes I have developed and which I plan to share here later. It is a very simple, quick, and easy to make recipe that contains only five ingredients. With the right soy sauce it is even gluten free. I hope you enjoy this wonderful sauce as much as we do. As a note, you don’t have to throw away the ginger slices produced by this recipe. You can eat them, use them as a garnish, or toss them as you see fit! I find them quite delicious myself. 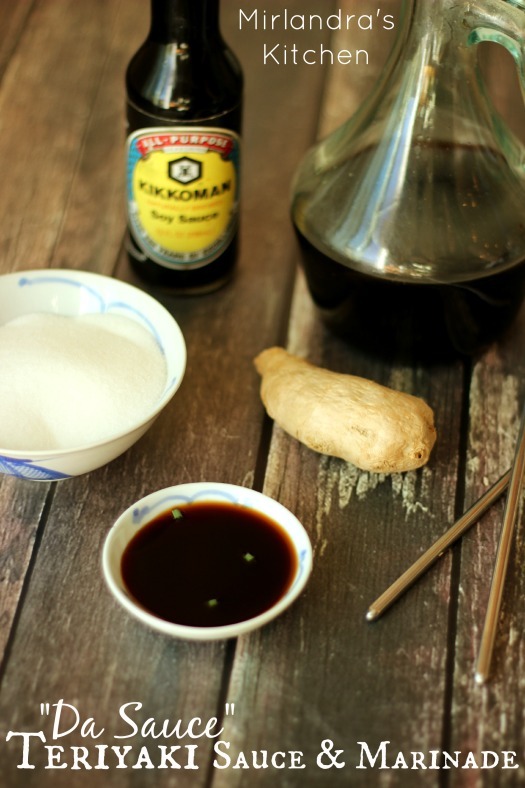 Combine water, soy sauce and sugar in a medium sauce pan. Slice garlic cloves into large slices and put into sauce pan. Grate ginger put into a large tea strainer. Add to pan. Bring sauce to boil for 5 minutes, stirring occasionally. Remove from heat and let sit for 4-5 minutes to cool. Strain out garlic slices and remove tea strainer. Thanks, Anne, I fixed the typo. Thank you for this! Local boyz is da best! Thank you! I missed Local Boyz since moving back to AZ and “da sauce” is the bomb! You are very welcome! It really is a great sauce – I use it often to marinate or stir fry with! This is magic! I grew up in Corvallis and moved across the country after college—missing Local Boyz ALL the time. This sauce is BOMB and made me happier than I could say when I discovered this recipe. Thank you so much for working to figure it out. Side note, I LOVE the Mac they serve too. The way I make it is SUPER easy: macaroni, mayo, tons of pepper, and da sauce. That’s it. Mix it to your desired profile. Yum! Thank you! I’m so glad you enjoy it! I just made a batch a few days ago and we used it today to marinate some steaks for the grill. I have a bit batch of my version of Local Boyz Mac Salad in the fridge just waiting for the steaks to be done! Mac Salad just makes everything better! It sounds like you have a great version you love. If you want my Local Boyz Copycat recipe for the salad you can grab it here: https://www.mirlandraskitchen.com/hawaiian_macaroni_salad/ Go Beavers!